When a bad traffic accident forced Star Liana York to take a semester off from college, she lost her financial scholarship. She was determined to finish college, but how was she going to pay for it? 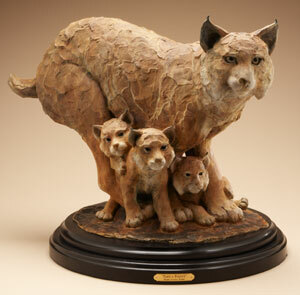 Star Liana York, Paws a Plenty, Bronze, 20" x 30" x 15"
But there was never any doubt that York would be an artist, and more particularly, a sculptor. 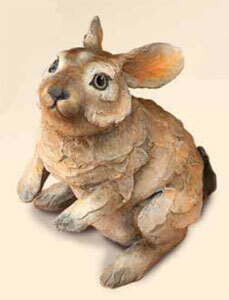 At 5 years old, she would go down into her father’s woodworking shop in the basement of the family home and use his jigsaw to cut out wooden figures of animals and people, which she painted. Before graduating from high school, she was molding metal fantasy figures and animals, and selling them in a local jewelry store. 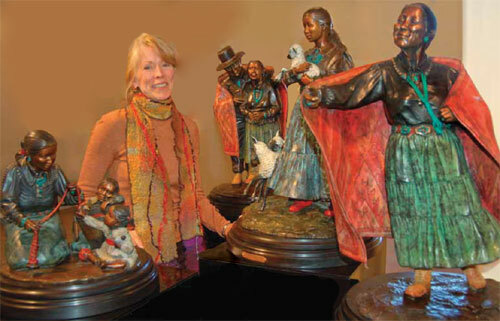 She never dreamed she would make a living with her art, but then, she had never been farther west than West Virginia and had never been exposed to the American West, with its variety of wildlife and its peoples—especially the American Indian. Today, York is widely known and collected, not because of any particular style she has developed, but for the variety of her subject matter and for the emotions and feelings that most of her pieces evoke. 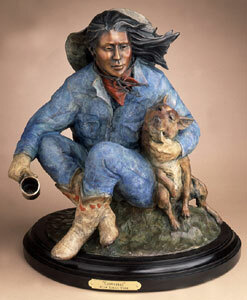 “I like to celebrate that special spark of life that the cowboy and cowgirl symbolize. I like the serenity of the Indian people. I like the raw power of nature in the animals, even hen in repose. I like to be passionate about things,” says York. 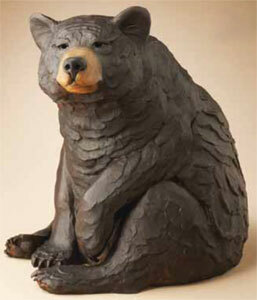 Star Liana York, Watch Bear, Bronze, 17" x 12" x 13"
Star Liana York, Newborn, Bronze, 22" x 36" x 16"
York was born in 1952 in a house her grandfather built just outside Washington, D.C., in Maryland, and that is where she was raised. Her mother had been a professional ballerina, and her father was an engineer who built stages for theatrical performances. Her parents met in New York City in the theater world, but moved back to Maryland before York was born, and she was the middle one of five siblings. 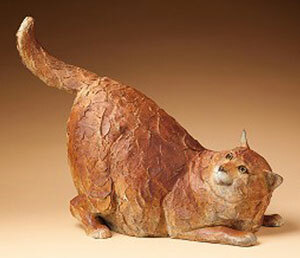 Star Liana York, Fat Cat, Bronze, 16" x 21.5" x 10"
leading York to begin working in metals at an early age. Then she was on to the University of Maryland, the Maryland Institute College of Art and the Corcoran College of Art & Design in Washington, D.C., before becoming a teacher in metal design casting and fabrication at Prince George’s Community College in Maryland. “I loved teaching and I loved the students. I think teachers are among today’s most unsung heroes, but I found that teaching drains you for anything else. I wanted to put my creative energy into my own work—I had to try it and see if it would work.” That meant giving up teaching, but it also meant living on the cheap again, and that was something she already knew about. “I rented a four-bedroom house with an attic and a basement converted into bedrooms,” and she was back in the ‘mini-dorm’ business. Star Liana York, Baby Jack, Bronze, 7.5" x 6.5" x 3.5"
It was a tremendous gamble, but forces were coming into place that would redirect York’s life. Almost all her work was small—less than six inches high—controlled as much by her style, as by the local foundries, which could not cast anything larger. “When I wanted to do larger stuff, I realized that I needed a new foundry,” says York. “I went to three foundries in New York and another in Baltimore that could handle larger pieces, but it could take a year to get a piece in there. 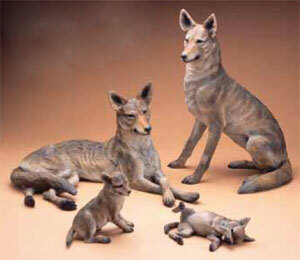 Then, one day, I was in the Smithsonian Institution and saw a display of Remington’s work done by a foundry in Santa Fe, N.M.
Star Liana York, Coyote Family, Back and left to right: Male 18" x 30" x 17", Female 28" x 21" x 17". Front Left to right: Pup 11" x 10.5" x 6.5", Pup 5.5" x 12" x 8"
The couple married and moved there in 1985. “And I wanted to get back to riding horses. My sister and I once pooled our babysitting money to share a horse, and I have always loved them. Now I wanted to get out West and ride again, especially in speed events, which are my favorites, and that is really Western riding,” says York, who now lives near Abiquiu, north of Santa Fe. Star Liana York, Touch the Earth, Bronze, 49" x 24" x 20"
Star Liana York, Cowgirls, Bronze, 17" x 14" x 12"
York’s mind is always open to new ideas with her antennae out, sensing a possible new experience. “We once had a horde of grasshoppers—grasshoppers everywhere. I had an apple tree that was covered with apples but did not have a single leaf. Someone said that turkeys would get rid of them, and they did, but the important thing we learned was that if you let these birds be free to express themselves, each turkey has a different personality—we even had one that we called King George because he was so pompous. 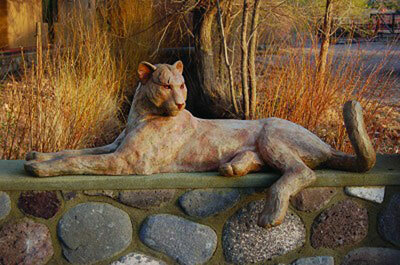 Star Liana York, Cat Call, Monumental Bronze, 21.5" x 67" x 25"
First husband became former husband in 2005, when after 20 years of marriage, the couple was moving apart. “My mother had recently died and it turned a light on inside my head, telling me that I needed to decide what I wanted for the rest of my life, and then pursue it. It had been so sad for me to see my parents struggling to be happy together when they were such vastly different people. They achieved a measure of happiness, but I thought my mother deserved a whole lot more than that. Unfortunately, they lived in a time when divorce was not an alternative, even at the cost of happiness.” York is now happily married to fellow artist, Jeff Brock, and the two often collaborate on pieces, especially horses. Wildlife, Indians, cowboys—all parade through her studio, but it is the horse that perhaps holds a special place in York’s heart. 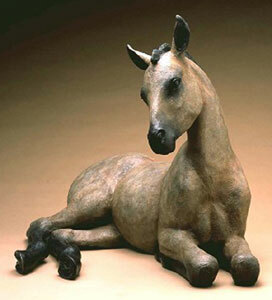 Her work traces the horse from the prehistoric cave drawings of Europe to the modern equine world. In prehistory, most of the horses drawn in caves were mares, celebrating birth. Over the ages, the horse has come to be more associated as an instrument of war, says York, who still enjoys pieces based on cave art. “I find more freedom in them. I can get away from the more posed nature of today’s horse statues. Their roundness creates the dynamic of expression. I don’t have to focus so much on the eyes, and I can let the motion of the horse speak for the emotion of the horse. 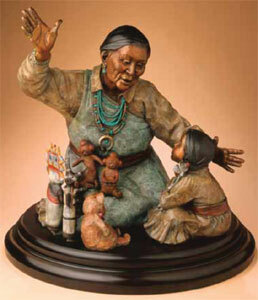 Star Liana York, Grandma's Gifts, Bronze, 24" x 24" x 24"
That’s emotion. That’s patience. That’s passion. That’s Star Liana York. 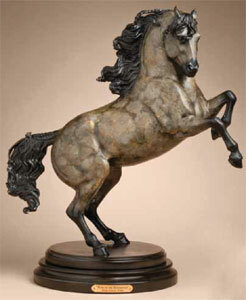 Star Liana York, Mare of the Renaissance, Bronze, 24" x 21.5" x 12"
Tony Varro is a free-lance writer living in Santa Fe, NM. Images courtesy of Star Liana York, photos by Wendy McEahern unless otherwise noted.